Stretch marks are an unfortunate reality that afflicts many women and can truly lower a woman's self image. Stretch marks have forced too many women to wear a sarong at the beach or to turn down the lights during intimate experiences. The good news is that stretch marks can go away. If you are plagued by the embarrassment of stretch marks then RevitaGen is the answer you have been waiting for. This product doesn't just cover up stretch marks like other creams on the market. RevitaGen is designed to actually make existing stretch marks disappear. RevitaGen uses powerful ingredients including three patented peptide molecules to rejuvenate the cells of the skin to return to a normal, healthy state. In addition RevitaGen's ingredients help to stimulate collagen production in the deeper layers of the skin. Stretch marks are basically a flaw in the deep layers of the skin, caused by inadequate moisturizing of the elastins and by fissures in the collagen. RevitaGen helps your body correct these issues, resulting in smoother, younger-looking skin! There are a variety of stretch mark creams currently available. RevitaGen is not only competitively priced, it also uses proven active ingredients to produce outstanding results. RevitaGen is the best choice for value and effectiveness. This product is used by men and women across America every day. RevitaGen is safe, effective and an excellent value. In addition, RevitaGen comes with a 30-day guarantee. Unhappy for any reason whatsoever? No problem - simply return RevitaGen for a full refund. Palmitoyl oligopeptide is a patented molecule proven to stimulate collagen synthesis in the skin. Also known effective at skin reconstruction and hydrating the deeper layers of the skin. Palmitoyl pentapeptide-3 is another patented molecule that increases collagen synthesis and hyaluronic acid production in the skin. This helps to revitalize damaged skin on the subcutaneous level. Yet another patented peptide molecule, palmitoyl tetrapeptide has been proven to suppress the body's production of interleukins, the chemical messengers that trigger inflammation. Traditionally used to help heal burns and wounds. Decreases appearance of scars (stretch marks are a type of scar), soothes inflammation and encourages wound healing. A moisturizer which soothes the skin and has been shown to help stimulate collagen synthesis. A type of Vitamin A long known to stimulate and rejuvenate skin cells. Much less irritating than other Vitamin A-based preparations. An herbal extract with many positive effects, including: powerful antioxidant activity, stimulates collagen synthesis, helps correct skin discoloration and helps to protect from UV radiation damage. Use RevitaGen before bedtime and at the beginning of the day. Clean and dry the skin. Apply RevitaGen to the fingertips. Use sparingly, as RevitaGen is a concentrated formula. Gently massage RevitaGen into the skin with a circular motion until it has been absorbed. You may experience a warm feeling as RevitaGen begins to work - this is normal. Other Ingredients: Deionized Water, RevitaGen Blend: (Polyglycerylmethacrylate, Propylene Glycol, Palmitoyl Oligopeptide, Palmitoyl Tetrapeptide-3, Glycerin, Butylene Glycol, Carbomer, Polysorbate-20, Palmitoyl Pentapeptide-3, Siegesbeckia Orientalis Extract, Phyllanthus Emblica Fruit Extract, Imperata Cylindrica Root Extract, Glucosamine HCL, Algae Extract, Yeast Extract, Urea, Hydrolyzed Wheat Protein, Hydrolyzed Wheat Starch, Bearberry Extract, Licorice PTH, Coneflower Extract, Hydrocotyle Extract and Aloe Vera Barbadensis), C12-15 Alkyl Benzoate, Glyceryl Stearate and PEG-100 Stearate, Cetearyl Olivate, Sorbitan Olivate, Sesame Oil, Cocoa Butter, Stearic Acid, Butylene Glycol, Sweet Almond Oil, Caprylic/Capric Triglycerides, PPG-12/SMDI Copolymer, Glycerin, Triethanolamine, Citric Acid, Xanthan Gum, DMDM Hydantoin, Shea Butter, Tocopheryl Acetate, Mango Butter, Peppermint Oil, Methyl Paraben, Propyl Paraben, Iodopropynyl Butylcarbamate, Retinyl Palmitate, Disodium EDTA, and Tetrahexyldecyl Ascorbate. As a proud mother of three, I would never trade my children for the world, but I have always wanted to get rid of the resulting stretch marks I acquired post pregnancy. 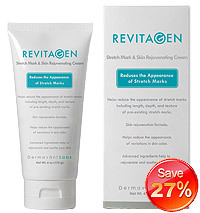 Well, months after using RevitaGen I have seen a marked improvement in the appearance of the marks. I was hopeful but unsure when I first started because the marks are several years old and kinda silvery, but the cream really caused a reduction. I am very excited and will continue to use RevitaGen to improve my stretch marks. I am a body builder who made tremendous gains not only in muscles but in stretch marks, especially around the shoulder and deltoid areas. Most products are geared towards pregnant women and the few items made for men do not work, or as far as I could tell. My girlfriend uses RevitaGen, and told me it worked for her after the birth of her son. Seeing her flawless skin, I decided to give it a shot and the change in the marks have been remarkable. RevitaGen is a wonder product and I have told all the guys in the gym about it. We may even pitch in to purchase bulk orders in the future so we can have them handy! During my entire pregnancy, I was lucky not to have suffered one stretch mark-post pregnancy however was a different story. My son, Alexander is now just eleven-months-old but I felt as if the marks were the only thing people saw when they looked at me. RevitaGen has allowed me to regain my confidence by getting rid of my worse stretch marks in just a few months. I had bad marks even on my underarms, but even these are mitigated-and I can wear short sleeves again. People don't think of guys getting stretch marks, but we can, especially if we gain a ton of weight really fast. I was proud of my weight loss but didn't know what to do about the stretch marks that seemed to be all over my body. I ordered RevitaGen and after several months the stretch marks are barely perceptible, I am wholly confident that RevitaGen will get rid of remaining marks, but they have gone down tremendously already and I feel great in my own skin! RevitaGen is amazing - two tubes down and I can't even locate the stretch marks that were on my stomach. This is truly exceptional considering the fact that I have had these marks for years! Unlike most women, I can't say for sure where they came from, but I never really liked them. RevitaGen has taken care of one the things I didn't like about my body! DermBoutique.com features only the best of the best - Skin Care for the Sophisticated. We have you covered for stretch marks, cellulite, dark circles and more!